We had a great year in 2015, from the time the ball fell in Times Square to this New Year’s Eve. 1. In the Northeast, rosemary doesn’t survive outside in winter and is a struggle to grow inside. But when its spring, summer or fall, having a rosemary plant outside the kitchen door allows the cook to brighten up many dishes with a last minute trip to snip a few sprigs of this herb. In southern California, rosemary grows outside all year ‘round! In May, Dorothy and I joined the congenial folks at Get Walking Claremont for a Thursday walk. Within five minutes, we found a shrub-sized rosemary bush between a sidewalk and the road. When I returned recently, the bush had lots of violet flowers and a swarm of tiny butterflies with black spots on the back of the wings and a blush of a blue/violet on the top. My friend Seymour has rosemary in front of his house in downtown LA and it’s a fixture in public landscaping work. I don’t like rosemary as a seasoning for lamb because I can’t warm up to lamb. But when I walk past these fragrant shrubs, I think of rosemary bread or olive oil infused with the herb! In California, the weather stays mild enough that the markets can stay outdoors into January - - or later. Some markets start out cold and require a warming cup of coffee, tea or cocoa. But things warm as the morning progresses and the variety of produce, cheeses and naturally raised beef or chicken calls like a siren’s song. This is the back of the original building in the Albright - Knox complex. Next to it is a modern addition. 3. The Albright-Knox Art Museum in Buffalo, New York has one of the best collections of Abstract Expressionist art in the United States. We visited there in the summer, when many of the main paintings were in a traveling exhibit. But a trip to the Albright-Knox when it’s missing its signature artwork is better than visiting many other museums when they have their complete collection. Look for a post devoted to the Albright Knox soon! 4. The Barnsider Restaurant in Albany is back on the Best of list because . . . it is the best of. This restaurant serves all different types of steak and beef dishes with a good variety of chicken and seafood for people who do not care for red meat. The salad bar and the martinis are a perfect complement to whatever entrée you order. And if a person is not in the mood for a big meal, a martini and the Barnsider’s shrimp cocktail are an unbeatable combination! 5. LAXon Lark is a new restaurant on Lark Street, in downtown Albany. The owners are from LA and are looking to share a fusion menu with Albanians. We dined there on Christmas Eve. The service was excellent, the menu varied and reasonably-priced and everyone enjoyed their entrees, which ranged from vegetarian delights to fusion tacos with beef and Korean barbecue sauce. 6. When we first started college hunting in 2007, our friend Frank hosted us in his home on the edge of LA and San Bernadino Counties. One evening he took us to El Ranchero on Foothill Boulevard, which used to be Route 66, in Claremont, California. We enjoyed that dinner but did not make it back until I was in Claremont this November. The food remains as tasty and attractively served as it was nearly 10 years ago. The wait-staff offers very capable, welcoming service and the menu offers a great variety of dinners. 7. In ‘n Out Burger: This California chain offers one of the best burgers in the world. The meat is fresh and well-cooked but not to the consistency of shoe leather. Shakes and fries are a perfect accompaniment. For fair weather diners, some restaurants have only outside tables; if it’s too cold, too hot or too wet other branches have an bright cheery inside dining room. 8. ZPizza is a chain, with a store in Claremont, that advertises organic ingredients. But what I like best is that their pizza is not greasy and does not taste as if it is loaded with salt. Diners order at the counter, whether they want to take-out or eat in. The staff are capable and congenial. 9. Handel’sIce Cream started in Youngstown, Ohio - - an hour or so south of Lake Erie on America’s North Coast. Since then, the chain has expanded east and west. 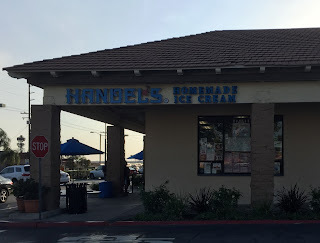 It is truly amazing to see a Youngstown business in California, allowing a person to enjoy one of the most flavorful ice cream recipes there is in a balmy climate. 10. The movie Spotlight is about the editorial and reporting team at the Boston Globe that broke open the scandal about priests who abused children in Boston. The abuse is very sad and the damage from it continues for some people today. But the movie is excellent because it shows how good old-fashion journalism with persistent research and working the streets scan illuminate social conditions, can comfort the afflicted and afflict the comfortable. 11. This blog is only possible because of family and friends. Lots of the places and experiences in the blog come from traveling with my wife Dorothy and my daughter Lily, as well as visiting or traveling with friends. Thanks to all of you! As usual, a smart and savvy "best of" list! I especially like the CA features and Spotlight--great choices!! Also nice pics! Fish, sunflowers and tomatoes. Couldn't be nicer.